It is often said that people have forgotten the true meaning of Christmas. I always say the opposite. I am astonished how many people really get it. My concern is that most of us don’t go on remembering it very long. Let me explain. Think about the number of lonely people or neglected relatives who will be given presents or who will be invited to stay at Christmas. There is something about the birth of the one who is going to say ‘love your neighbour as yourself’ and ‘do good to those who persecute you’ which is powerful enough on the edge of Christmas to provoke us into being kinder. But we may not be thinking about them much or have time for them when we are busy again with 2019. Or think of the support given to the Christmas shelters set up by the charity Crisis. There was something about the message of the child born in a stable because there was no room in the inn which instinctively makes us really uncomfortable about the idea of others being homeless at Christmas. But for some reason support for those living on the street will be much less in the coldest days of the first two months of the New Year. Or, in the year of the centenary of the end of the First World War, take the famous story about soldiers from opposing armies climbing out of their trenches on Christmas Day and playing football in No Man’s Land. There was something about the message of the birth of the promised Prince of Peace which they got. But it wasn’t long before they were made to forget it and started to shell and machine gun each other again. So, I don’t ever say that people have forgotten the real meaning of Christmas. Every year I’m glad to see signs all over the place that the message of Jesus’ arrival has really got through. My worry about myself as much as anyone else is that we are not as good as we should be at continuing to respond to that message when the decorations have come down. For a resistance fighter, a spectacular victory becomes the moment of great danger. Once the convoy or the oil field or the ammunition dump is exploded, those responsible are targeted men. So it was for Elijah. At Mount Carmel, he humiliated the apparently all-conquering Taliban-like prophets of Baal in fire brought down from heaven and then he slaughtered them. It ignited Queen Jezebel, no less, who swore his destruction – and he fled for his life. Being hunted down and under the stress of trauma, he went a hundred miles south to the edge of the Negev, then a further day’s journey into the desert itself. There he collapsed under the shelter of a rare tree, prayed for death, and, mercifully, fell asleep. At which point (the exquisite five verses from 1 Kings 19.3-7 were read on a recent Sunday) God’s messenger-angels touched him. They did so twice. They provided warm bread and cold water. One might have hoped they would also provide an answer to his final despairing prayers – you are safe, the likes of the prophets of Baal and Jezebel will be defeated. But instead their message to the man at the extremity of coping seemed simply to be – go further into the wilderness. And there, alongside those whose bereavement or depression or pain or mental illness or approaching death seems unremitting and unbearable, I was glad to stop reading. The second angel-touch was ‘take the tiny sustenance here, else the journey will be too much for you’. Once Elijah has indeed traversed the Negev and Sinai deserts for forty days, he will come to a new experience of God and a new understanding of what he should do. But that isn’t yet, and we didn’t read that far. We only read the verses in which God’s messenger-angels found him in wilderness, touched him, and told him that he needed to go deeper into the desert, a journey which would be almost too much for him. So, I thought of Paul asking God three times to take away whatever the thorn in the flesh and the message of Satan which beset him might be, and get only the answer ‘my grace is sufficient for you’ (2 Corinthians 12.9). And I thought of the viaticum – literally, the things which pertains to the ‘via’ (the ‘way’). The word comes from the necessary supplies granted to a Roman ambassador as he set out. It is used in the Catholic church particularly of Communion give to the dying. Way-bread. Food for the journey. It seems vastly insensitive and crass to say to those facing what is unendurable that God’s message might be stick with this, go deeper into it, and you will see that it can bring you to fresh insight into God and enhanced self-understanding. But always simply to pray instead that the all-powerful God will be heal, defeat evil and take it all away seems to miss what the messenger-angels were saying to Elijah. It is something just hinted in my own comfortable and untraumatic experiences – from an occasional willingness to stay with difficult questions rather than settle for the first obvious or more comforting answers through to learning tiny things about myself through hardly challenging experiences of fasting. So it is something I just might more fully recognise if and when debilitation comes or I am granted a final illness. And Jesus’ own ministry began actually being led by the Spirit into the wilderness for forty days, and ended with going deeper into suffering rather than magicking it away. That can’t be a coincidence. Emergency hospital admissions in Frome have fallen by nearly a fifth in three years. In the rest of Somerset, they have increased by nearly a third. It seems it has been done by prescribing not medicine but community. One imaginative doctor has worked away at a ‘Compassionate Frome’ project. It points people towards the support or community group they need. It notices gaps in provision and badgers people and churches to fill them. Some of us in some of the churches along the Worth valley have been praying and thinking about this. First we noticed how much is already going on. The Place of Welcome on Monday mornings at St James’, Cross Roads, part of a scheme across the whole Bradford Council area. Christians Against Poverty’s local debt advice centre in Keighley being in touch about support it can give in the Worth valley. A group of those with learning difficulties being invited to serve the local community out of a weekly session at West Lane Baptist Church in Haworth. And those are just three examples someone has spoken to me about this week. Secondly we noticed how willing people are to talk about the possibilities, at our local Medical Centre, among those fundraising for better mental health care provision in the Worth valley, by Bradford Council’s Ward Officer, in the activities of the local Methodist Circuit, and so on. If you hear things soon about work for a ‘Healthy Haworth’, remember you first read about it here. Or rather, you may have already read about it in the history books. I’m proud to be the successor of the Revd Patrick Brontë. In the nineteenth century he had schools built in Haworth and in Stanbury. His work to get new sewage systems for Haworth saved literally thousands of lives. I have never liked April Fool’s Day very much. Being made to look stupid never feels like much fun. And enjoying catching other people out doesn’t feel very clever. I’d rather we had done without it. But this year, April Fool’s Day falls on the same day as Easter Day, so I’ve been thinking about that coincidence. I find most of what needs saying is spelt out by Paul in the second half of the first Chapter of his First Letter to the Corinthians. “The message of the cross,” he writes, “is foolishness to those who are perishing, but to us who are being saved it is the power of God.” God’s choice to live as a human being and face everything a human being faces seems like plain stupidity to most people, but Christian people relish what God has chosen to do. “God chose the foolish things of the world… God chose the weak things of the world… God chose the lowly things of this world and the despised things.” God chose to be called an April Fool. God chose to be on the side of those who feel victimised and those who feel caught out. We shared a final Christmas thought at our Church Council at the end of January to mark the baby Jesus being brought to the Jerusalem Temple forty days after his birth. The thought comes from John Bell of the Iona Community. Very little of this is actually about small children, he says. From the beginning of the story (when Elizabeth is told she will be the mother of John the Baptist despite the fact that she is beyond child-bearing age) to Jesus being brought to the Temple (when Anna, who we are told is in her eighties, praises God and speaks about Jesus) it is most usually older people who are given new hope. So John Bell says that he is never happy when a congregation tells him that they do not see much future as it now consists mainly of elderly people. Jesus coming among us with new possibilities we don’t expect has always been the message – particularly where there are faithful older people praying. So, we look forward into Lent. The feast of Jesus’ ‘Presentation in the Temple’ is sometimes characterised as the moment we turn from facing the crib to facing the cross – Simeon, the other prophet in the Temple, took the child in his arms but also spoke of the pain which Mary would have to endure in the future. I’ve just taken down my copy of the Good News Bible, prepared in ‘standard, everyday, natural English’ and published in 1976. It was given to me by my mother for Christmas that year; I would have just completed my first term in the Sixth Form. I remember the excitement of the sales pitch that the word translated since Anglo-Saxon times as ‘Go(d’s)spel’ was here directly rendered ‘Good News’ and being intrigued by how much more could be opened up in the same way (as, for example ‘repent’ becomes ‘turn away from your sins’). Three years later, in my first term at University, I was trying to come to terms with the vocabulary of New Testament Greek myself, words like logos (word), phone (sound) and thanatos (death). I found that the prefix eu- (nice) turned each of these into English words I recognised: eulogos (nice words) gave me eulogy (a spoken tribute); euphone (nice sound) gave me euphonious (pleasant to hear); euthanatos (nice death) gave me euthanasia (mercy killing). So I found exactly where the sale pitch of the Good News Bible was grounded: an angel is a messenger, and thus euangelion (nice message) gives us evangelist (a writer or proclaimer of what at different stages of the development of English has been rendered gospel, glad tidings and good news). It was only much later that I found that the New Testament writers who wrote the word ‘euangelion’ were also reading it as a word in their own Bibles – the standard Greek translation in their own time of what we call the Hebrew scriptures or Old Testament. And here, as often as not, euangelion was being used for the announcement of a victory, almost as if it was in fact a technical term for a joyful despatch from a battlefield. 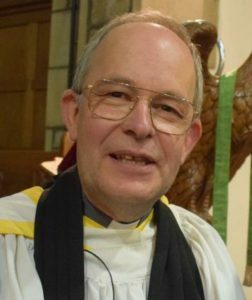 So, on a Sunday in Advent 2017, as the opening words of Mark’s Gospel came round once more and we began to proclaim ‘This is the Good News about Jesus Christ, the Son of God… I will send my messenger ahead of you to clear the way for you… someone is shouting… make a straight path for him to travel’, I was put in mind of Rowan Williams’ reminder that this has the force of an announcement of regime change. Not Good News as in ‘settle down children and let us hear some of the lovely stories about Jesus – and then we can have a hot drink and go to bed and have sweet dreams’. But Good News as in ‘dance in the streets because the word abroad is that the despot who has been in charge for far too long is under house arrest and the expected successor is now actually in the country – and then align yourselves urgently with the new possibilities opening up in front of you lest either he’ll find you colluding with the old corruption or we’ll all miss the chance and the new cabinet will simply get filled up with the same people as the old one ’. What can you remember about the story of Jesus healing a group of ten people? Recently, a Bible Study Group at St Michael’s had a go. Between us, we remembered that a journey had been taking place when ten lepers living in isolation from their communities (possibly in a cave) asked Jesus for healing and were granted it. Jesus told them to show themselves to the religious authorities to demonstrate that they were healed and could be reintegrated into society. Only one of the ten came back praising God and saying ‘thank you’. We looked at Luke 17.11-19 to see how well we had done. Neither the cave (which is the traditional site) nor the reintegration into society are mentioned in the passage. We guessed that sermons had mentioned these details over the years and the details had stuck in our minds. Some members of the group were moved to notice that it wasn’t that the lepers were cleansed and then sent to the priests. It was in doing what Jesus told them to do (going to the priests) that they found themselves cleansed. But by far the most striking thing was we’d totally forgotten that a Samaritan was involved. Jesus was journeying to Jerusalem and along the edge of Samaritan territory when the lepers call out to him ‘from a distance’. The one who came back to give thanks was a Samaritan. And Jesus’ comment towards the end of the passage was that it was only this ‘this foreigner’ who did so. I’ve looked the word up. It is allo-genes which is literally ‘other-bred’ and may be somewhere between ‘people not like us’ and ‘mis-begotten’. So, could it be that the way we’d been told the story so often simply focussed on the easy and respectable message that we should remember to be thankful? But we’d not been marked by the real bite of the passage at this point that is the despised other who did so? Perhaps what Luke wanted us to hear was ‘those whose religion we are tempted to despise (whose versions of Christianity are least attractive to us, or those who are ‘other-bred’ culturally or literally) can be where we find both examples of trust in God and some specific human qualities which we sometime lack ourselves’? Almost the first thing I learnt in Haworth was about how parcels of land on the moors were worked so that they might be useful for agriculture. There were a host of special implements and I was even shown some of them. It was clearly a long and backbreaking job to make even a patch on the edge of the moor productive. This turns out to be the origin of the word ‘royd’, which is the very local name for the clearings and fields brought into cultivation in this way. I have particularly enjoyed learning since then that two hundred years ago surnames which end in ‘royd’ (such as Ackroyd, Holroyd and Murgatroyd) were hardly known outside this part of the West Riding. So I had a new picture in my mind when reading Jesus’ parable of the sower. It is certainly not about ‘those out there’ who pay less attention to God than fruitful people like ‘me’. Perhaps it was about a man called Oldroyd. Over the years, he’d trodden down a new path on his long walk to his patch on the edge of the moor. He’d invested a huge amount of time and effort in creating his royd there. He continued to have to work hard to keep it clear. And he was finally bringing home a basic crop of grain. He knew full well that seed which spilt on the trodden path just sat on the surface. I fear that there are messages from the Gospel which glance off me without my even noticing. He knew that seed which spilt over the edge of his royd onto the uncleared moor next to it would hardly take root at all. I suspect that there are messages from the Gospel which I notice fleetingly but which I’ve soon forgotten. He knew that what grew from seed which fell where he had not kept on top of the clearing would get outcompeted and smothered. I realise there are messages from the Gospel to which I pay attention for a little while before they get crowded out by my habits and my busyness. And he knew the huge cost of bringing home the grain which he did manage to grow. I know just how hard God has had to work so that there are messages from the Gospel which do produce what God wants in me. Among the thousands of requests left on the Prayer Tree in St Michael’s, Haworth, the most frequent refer to cancer and to early death. Given that Patrick Brontë lost his wife to early death by cancer, we have developed a Haworth-branded leaflet about his bereavement to have available by the Prayer Tree. The Revd Patrick Brontë had only been the parish priest of Haworth for seventeen months when his wife Maria died of cancer of the uterus on 15th September 1821 aged 38. It had been a long and harrowing illness. There was no pain management such as a modern hospital or hospice can now provide. Maria was also extremely distressed at leaving her six children. Among them, Charlotte was five, Emily was three and Anne was one. Tender sorrow was my daily portion; oppressive grief sometimes lay heavy on me and there were seasons when an agonising something sickened my whole frame, which is I think of such a nature as cannot be described and must be felt in order to be understood. And when my dear wife was dead and buried and gone, and when I missed her at every corner, and when her memory was hourly revived by the innocent yet distressing prattle of my children, I do assure you, my dear Sir, from what I felt, I was happy at the recollection that to sorrow, not as those without hope, was no sin; that our Lord himself had wept over his departed friend, and that he had promised us grace and strength sufficient for such a day. Several things stand out from those words. First, his grief was so extreme that he could not even explain what it was like. It is rarely helpful to tell someone that we ‘understand what you are going through’. Secondly, he did not feel that there was anything wrong in expressing that grief (‘to sorrow was no sin’); he remembers that Jesus wept at the grave of his friend Lazarus. There are cultures in the world where bereaved people are expected to wail, and the modern English habit of trying to hold everything together probably doesn’t help anybody. Third, it is striking that he doesn’t say: ‘my faith has saved me from feeling extreme grief’. Nor does he say the opposite: ‘this tragedy has destroyed my faith’. Those would be far too simplistic reactions. The much deeper genuine reality for him was that his human ‘agonising’ and his Christian ‘hope’ were woven together in his grief. His friend would have recognised two quotations from the Bible in what Patrick wrote; these were the threads of hope which he was able to weave around what he said ‘sickened his whole frame’. I do not want you to be uninformed about those who sleep in death, so that you do not grieve like the rest of mankind, who have no hope, for we believe that Jesus died and rose again, and so we believe that God will bring with Jesus those who have fallen asleep in him. But God said to me, ‘My grace is sufficient for you, for my power is made perfect in weakness.’ Therefore I will boast all the more gladly about my weaknesses, so that Christ’s power may rest on me. Lord Jesus, you wept at your friend’s graveside; weep alongside us, alongside those whose grief is indescribable; mix resurrection hope with our tears; grant enough grace to us, enough strength to them. Amen. You may not realise it but I’ve moved to you from an earthquake zone. We were alerted to this by the earthquake centred on Market Rasen in 2008. I slept through it myself, but many people woke and felt the room moving around them. It was at 5.2 on the Richter Scale, which people guess was about the force of the Lincoln earthquake in 1185 which actually caused the first Lincoln Cathedral to collapse. What I have only just discovered is that there are earthquakes going on in northern Lincolnshire almost all the time. Only specialised measuring equipment could detect them. Each of these was about nine miles deep, for which compare the less than one mile depth of most oil and gas well drilling. They averaged 1.6 on the Richter Scale, a tiny fragment of the force of the Market Rasen earthquake. The ground is moving beneath us almost all the time. What we think is solid and unchangeable is in fact always under huge pressure and this often results in small sudden shifts. I had noticed again that one of the four Gospels tells us there was an earthquake when Jesus rose from the dead. Matthew may be telling us that solid ground of our previous assumptions about the finality of death and about much else suddenly shifted that day. So my prayer as I move to West Yorkshire is this. I trust that deep underneath everything we assume is desperate or dull, solid or stable, God is still moving in ways we do not yet notice. My prayer is particularly for those in something like bereavement or depression. It is for those who are stuck in a situation where a debt or a harmful relationship or almost anything else seems unchangeable. It is for all the English churches where people fear that things do not move as God wants them to. There is an extraordinary poem near the very end of which it says of God “let him easter in us”. Let the one great earthquake of the resurrection alert us to God’s continued slow hidden work deep within us all the time.